This is a paid review of Coral Island Blackpool. All views and opinions are my own. As a parent, saying ‘no’ becomes a habit. Denying requests for expensive toys, late nights and sweets galore. Sometimes though, it’s good to say yes. So, when we were invited to spend a day at Coral Island in Blackpool, I decided to use it as a ‘yes’ day. Because Coral Island has everything the children love. Games, rides, arcade machines that you can win tickets on to exchange for prizes. All the things I’d often say ‘no’ to. So, how did it go when I said yes? 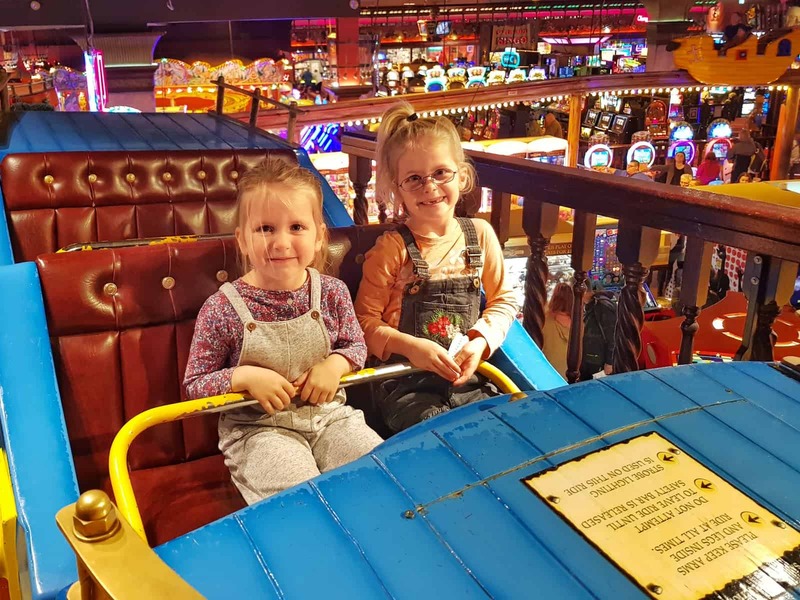 Located directly opposite the beautiful Blackpool seafront, Coral Island is an indoor, free to enter family attraction. Its signature skull and crossbones above the door means you can’t miss it. 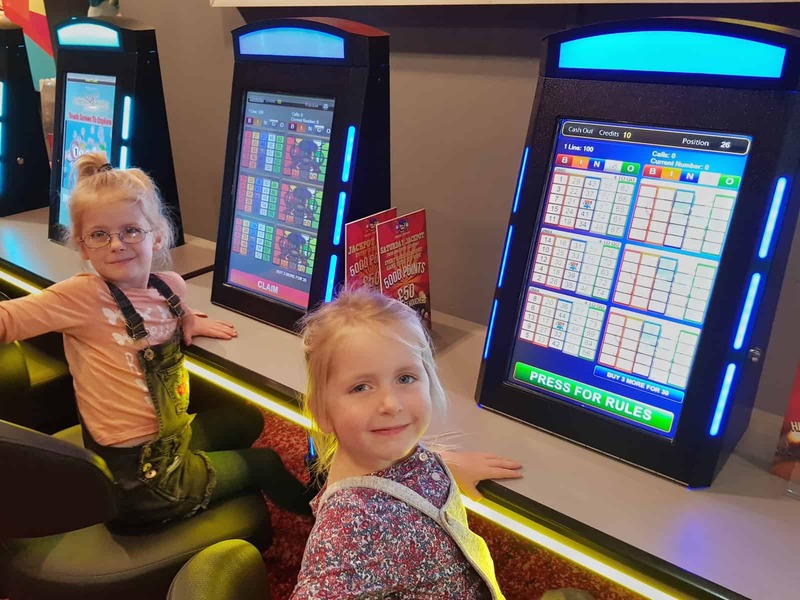 With four restaurants, rides, arcade machines grabbers, games, bingo, camel racing and an over-18’s gaming area, it’s a great way to accommodate the whole family. Open from 10am to midnight, the Coral Island restaurants serve all meals including breakfast. 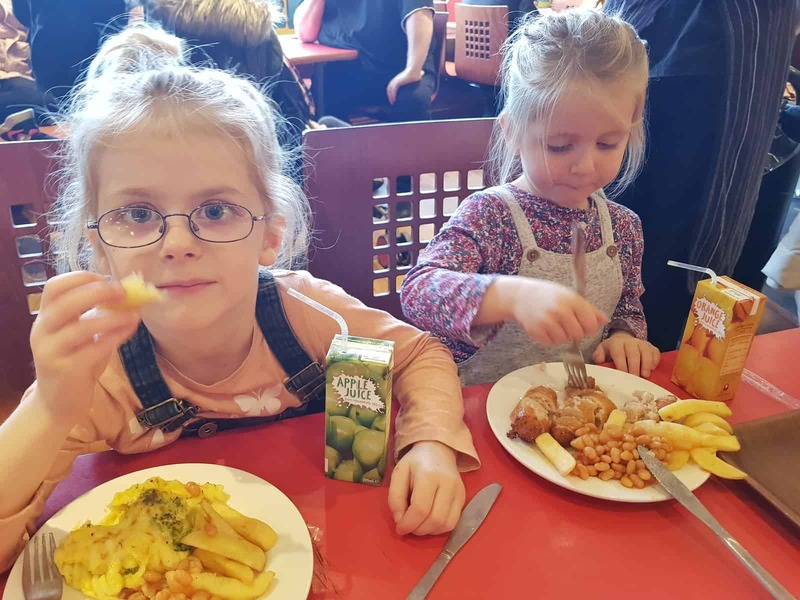 What’s more, kids eat free in all four restaurants. One child’s meal is free with each paying adult. 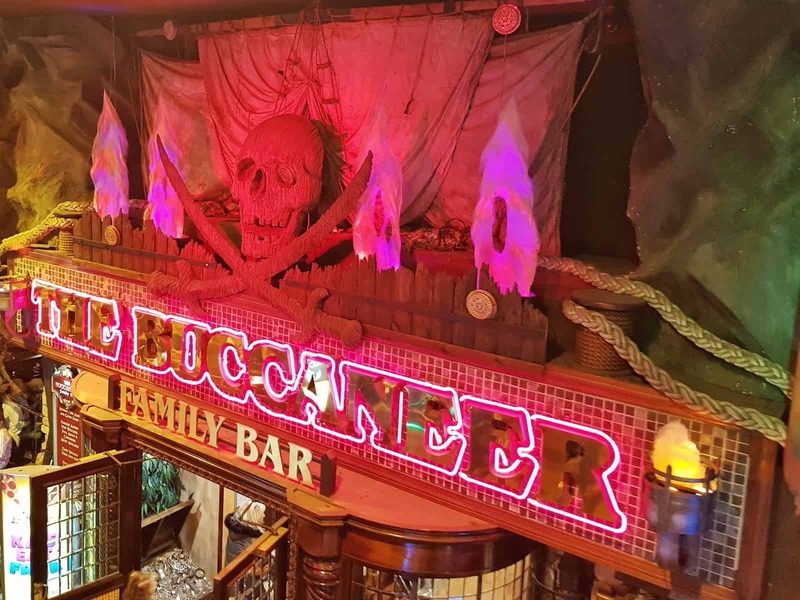 Choose between the traditional chippy, Captain Jack’s, the Buccaneer or Peggy’s Snack Bar. We visited on a Saturday afternoon and it is an incredibly popular place, so all the restaurants were busy. There was a 20 minute wait for a table in Captain Jack’s, so we decided to go for Peggy’s Snack Bar. As I was on my own with the girls, I had to pay for one for their meals. However, with the one I paid for coming in at under £3, our food came to just over £11 in total. Great value and it was quick and tasty too. 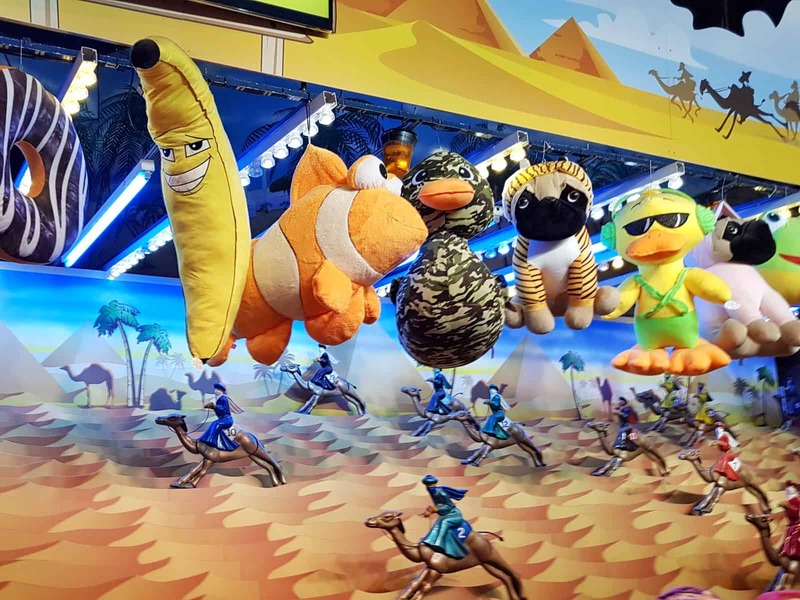 There’s a huge variety of games at Coral Island, from the amazing VR ride, complete with headsets, to fruit machine style games where you can win tickets. Gaming fans will love sitting at a machine and getting absorbed into a new landscape, or enjoying an old favourite. My little ones don’t really play games, but they were incredibly excited to see that there was an air-hockey table. 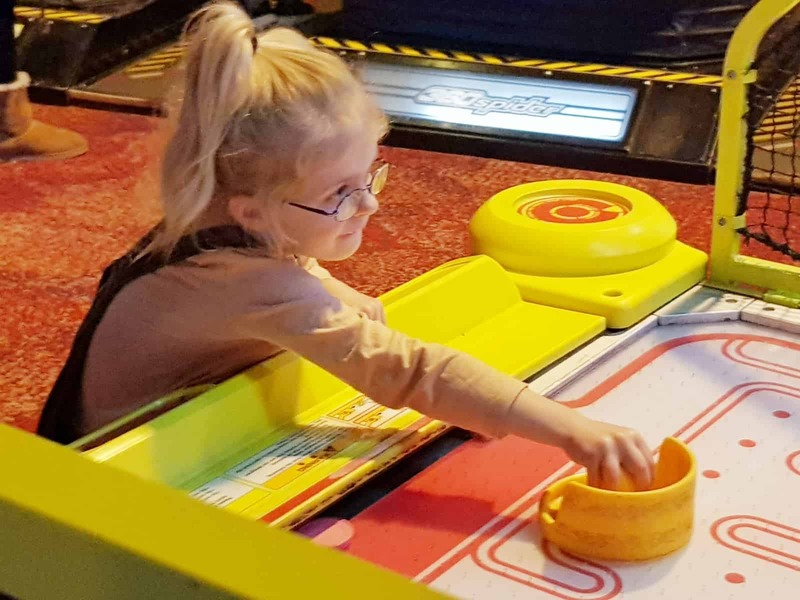 Despite having a miniature air-hockey game at home, they always ask to play whenever they see it when we’re out. And as it was a ‘yes’ day, they got their wish. It wasn’t just normal air hockey either, there was one large puck and numerous smaller ones on the table. Definitely their favourite air-hockey experience so far. Another exciting discovery for the girls came in the form of children’s rides. Better still, they were pirate-themed! The thought of the Pirate’s Quest ghost train was a bit scary for them, so they chose the fun Pirate Flyer instead. At £2 for a single rider and £3 for two, it cost us a total of £5 to go on. We all went on the same boat, with the girls at the front to enjoy the view. The ride takes you on a tour of Coral Island – from a prime vantage point up near the ceiling! I was surprised to see that there was a whole little world up there. As well as looking down and doing some people watching, we discovered an ‘underwater’ world with pirate caves full of hidden treasure. The girls would have gone on this several times because they loved it, but there was so many other things to explore that we only ended up having one ride. Whenever we’ve been into an arcade before, the girls have made a beeline for the 2p machines. Coral Island was no exception, except that the 2p machines were bigger and better. Some had prizes in them as well as coins, and others gave out tickets. I let the girls choose what to play on, and they loved the 2p machines that gave out tickets. 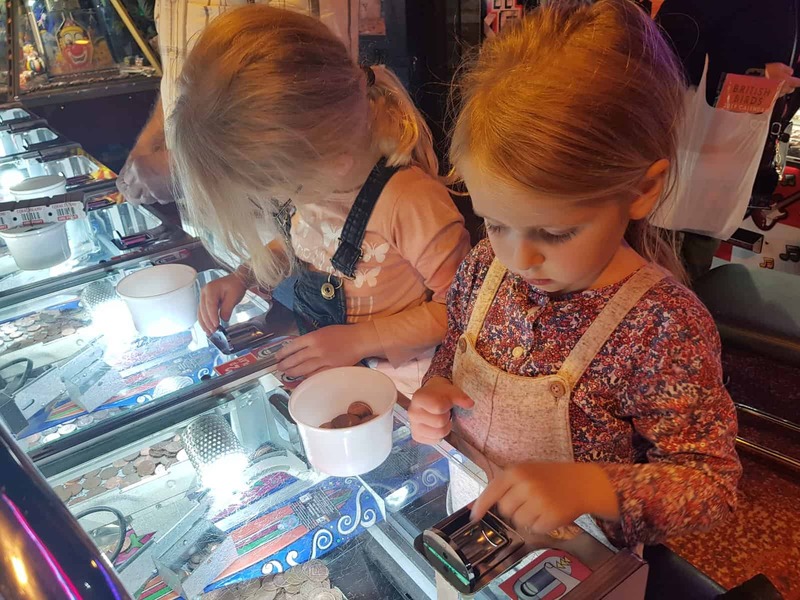 They knew they’d be able to exchange them for a little prize at the end, and were so excited every time some 2ps dropped or tickets fired out. In fact, when they’d spent their 2ps we went to play on some other things and they insisted on going back for more before we went home. The other thing they loved was the little grabber that picked up tickets. They soon realised that they could have several goes on it and that it actually picked the tickets up. So, they added to their stash and waited in anticipation to see what prizes they’d be able to choose. Bingo at Coral Island is a cross between the traditional game and a computerised version. Each of the girls sat in front of a screen with bingo grids on. The caller read out the numbers and they had to press to say they’d got them. It all went a bit fast for us with Lia not being very sure on her big numbers, so we decided Camel Derby might be a bit more appropriate. Camel Derby is a really fun, interactive game. Rather than just putting money into a slot and seeing whether your camel wins, the game at Coral Island lets you influence the result. Each player has three balls to throw into a series of holes. Some score more than others and each time a ball goes down the hole, the camel moves along a little further. Lia found it difficult to throw the balls in the right place to start with and we did have a couple bounce off in random directions. 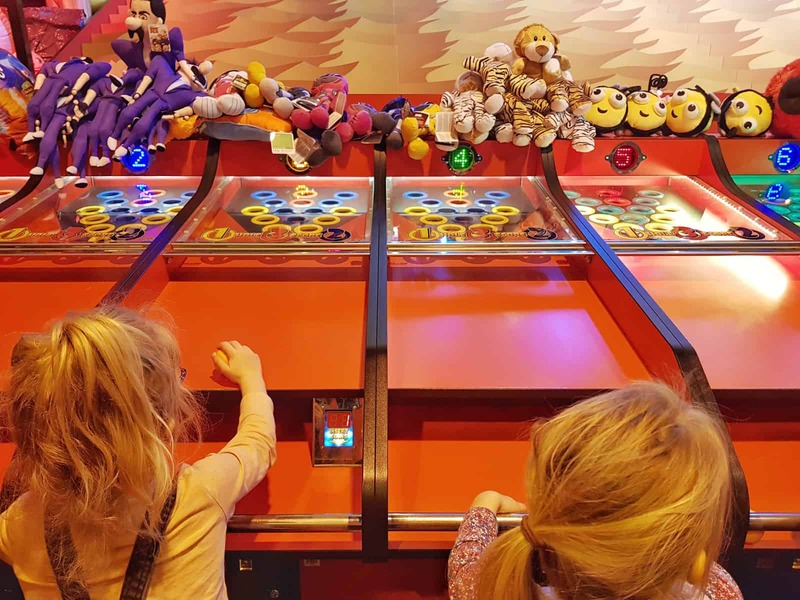 She soon got the hang of it, but neither of them were a match for the adults playing so they didn’t win anything and it wasn’t long before they were ready to head back to the 2p machines. As I was on my own with the children, I didn’t get chance to check out the over 18’s area at Coral Island. However, I was impressed with how well it was separated from the rest of the arcade. 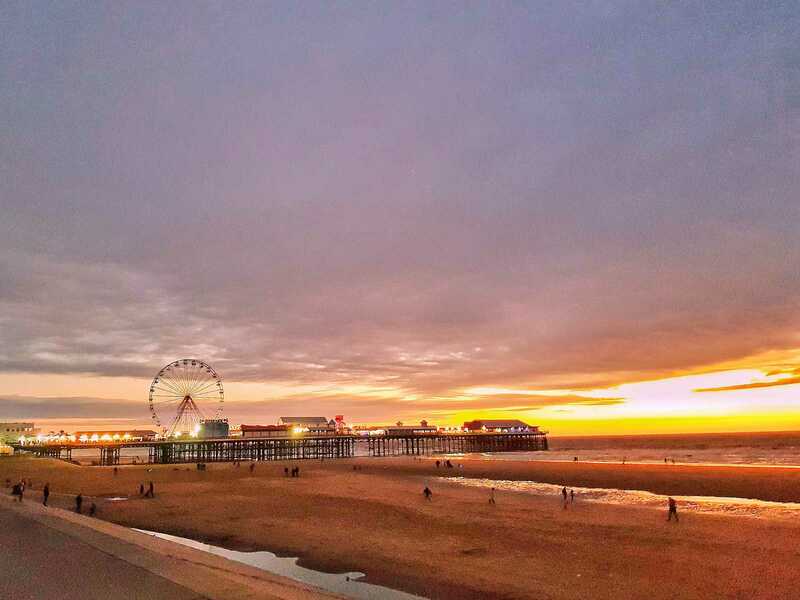 For adults in Blackpool who want to gamble, the casino is an oasis of calm away from the children and families. For those of us needing to steer away from it, there were friendly staff at each entrance to make it clear that this area was for over 18’s. I knew that tickets could be exchanged for prizes at Coral Island, but wasn’t quite sure how or where. The staff member I asked helpfully explained the process and pointed us in the right direction. You feed tickets into a machine which counts them. Then, it prints off a receipt that you can take to the prize shop. The number of tickets on your receipt determines what prizes you’re eligible for. The girls chose a flashing bouncy ball each and still had some tickets left over. So, I asked the member of staff behind the counter what they could have and she got them a selection of sweets. Everyone gets a free stick of rock too, much to the children’s delight. I spend so much time saying ‘no’ to the girls requests that sometimes I’m not sure I even hear them properly. But when I resolved to say yes, it became easy. Because actually, they didn’t ask for much. They wanted to play on appropriate games and eat something fairly healthy for dinner. Joy ensued when I let them go on a ride and play air hockey. They chose toys that were perfectly reasonable and didn’t ask to eat their sweets straight away. In fact, everything I said yes to in Coral Island was a resounding success. I may have got a little carried away though, when I allowed them to have candy floss as we walked along the seafront to see the illuminations. By the time we got back in the van, they were high as kites which reminded me why not every day is a yes day. Coral Island Blackpool opening times: 10am to midnight daily. Are dogs allowed at Coral Island Blackpool? No dogs are allowed except for assistance dogs. 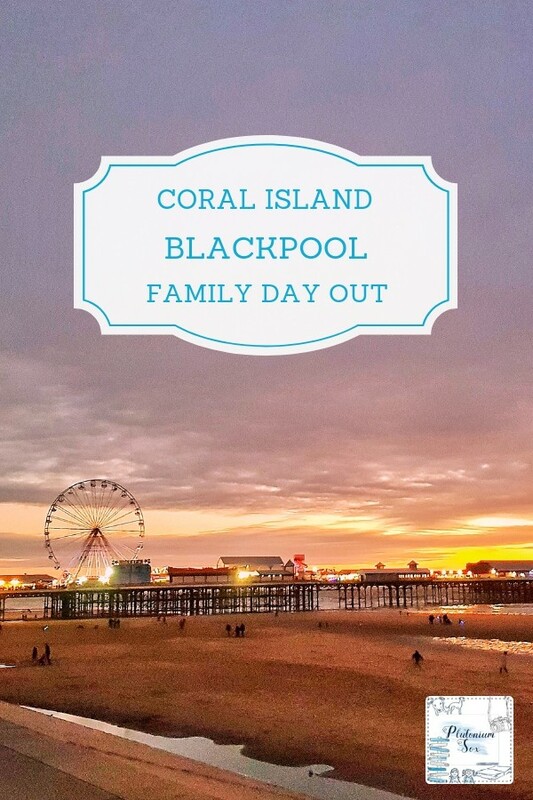 Coral Island Blackpool parking: The closest Car Parks to Coral Island are Bonny Street Car Park and Central Car Park, both of which are open 24 hours. More information about Blackpool car parks is available on the council website. 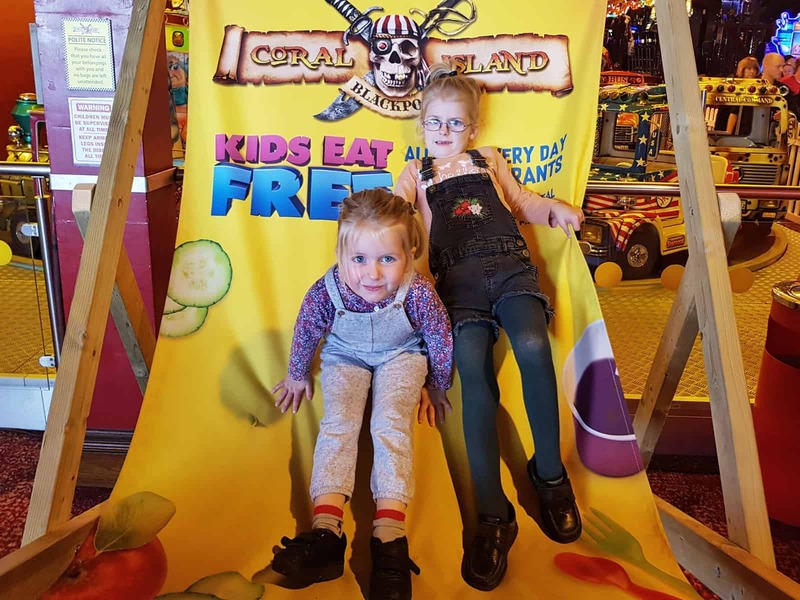 Coral Island Blackpool reviews: You can find some other reviews over at The Brick Castle and Going on an Adventure. 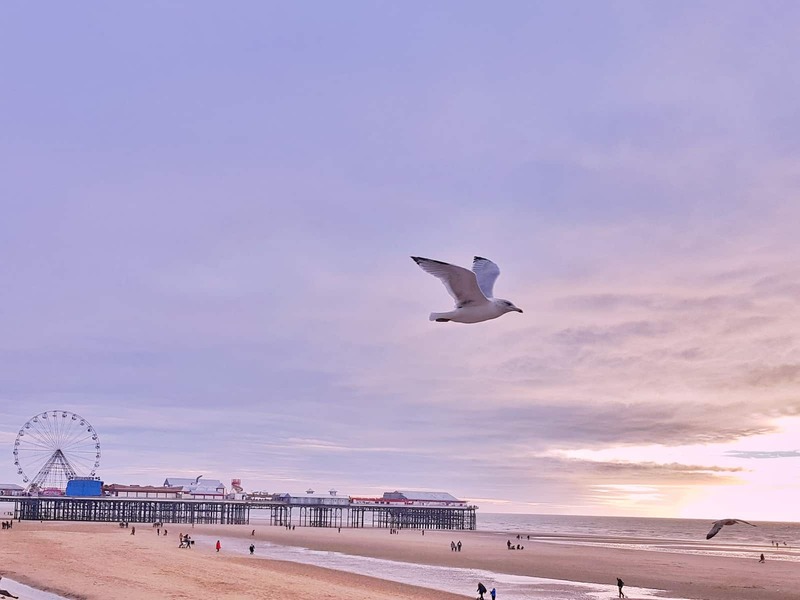 Hotels and accommodation near Coral Island Blackpool: Head over to the Visit Blackpool website for information on local hotels and accommodation. Any other questions about Coral Island Blackpool? For more details about Coral Island Blackpool, visit their website. 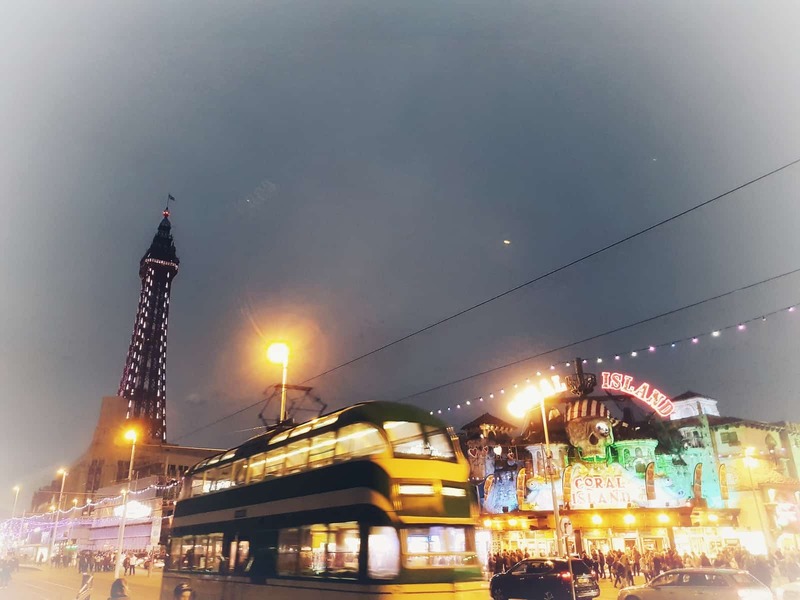 We took our two to Blackpool a couple of years ago and we had such a wonderful weekend, you’ve reminded me that we must go again soon. And I’m pretty sure that we spent a fair bit of time at Coral island, it looks very familiar! I’m so glad you enjoyed it as well. We had a really lovely weekend, such a great break. It looks like you all had great fun. 2p machines are pretty much irresistible, aren’t they? 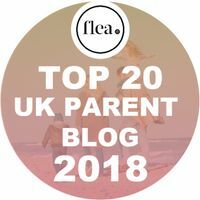 I am definitely mean mum who says ‘no’ to things, so the kids have just learned not to ask! I’m much nicer on holiday though and they know that an ice cream every day is a fundamental part of the holiday! 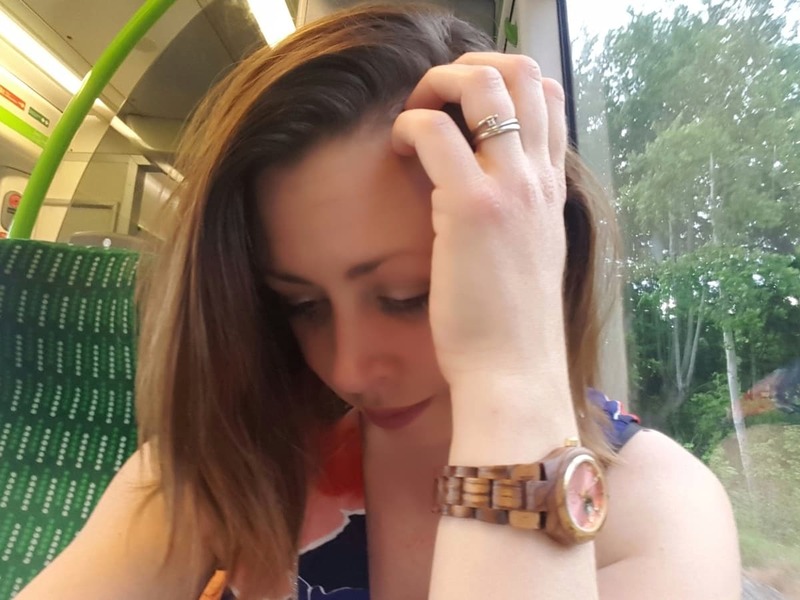 Yep, I’m much nicer on holiday too, and I’m definitely a ‘no’ mum generally, especially when it comes to things like sweets. Good theory on ice cream every day on holiday! They did thank you, it was a brilliant day. Hope you have a great time when you take yours. Hi Nat, I’m wanting a plate of hot chips now!… What a nice day out and as it’s all indoors it’s the perfect place to headthis time of year. It looks like our girls enjoyed a day of Yes’s. It is nice to see that 2p arcade machines are still a thing. They look identical to the ones I enjoyed in my teens and we all thought they were cheap then. Yes, the 2p machines are still going strong! We had a brilliant time thank you. Hope you manage to get hold of some chips!